An original letter of correspondence between brothers and business partners Joshua Coffin Chase and Sydney Octavius Chase. 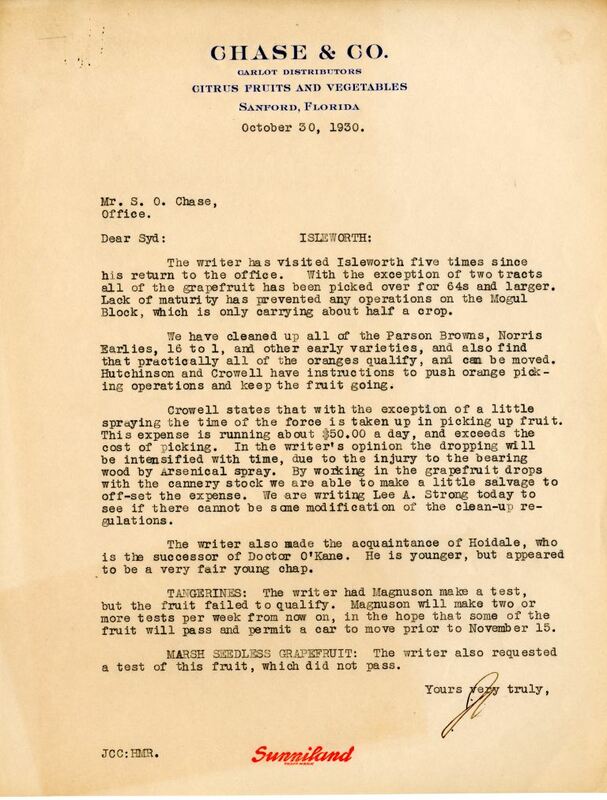 Topics discussed in the letter include Joshua's multiple visits to Isleworth Grove, the lack of maturity noted while inspecting crops, the estimated expenses of spraying, Joshua's introduction to the successor of Doctor O'Kane, the quality of tangerines, and the failed testing of grapefruit. Original letter from Joshua Coffin Chase to Sydney Octavius Chase, October 30, 1930: box 49, folder 20.84, Chase Collection (MS 14), Special and Area Studies Collections, George A. Smathers Libraries, University of Florida, Gainesville, Florida. Digital reproduction of original letter from Joshua Coffin Chase to Sydney Octavius Chase, October 30, 1930. The writer visited Isleworth five times since his return to the office. With the exception of two tracts all of the grapefruit has been picked over for 64s and larger. Lack of maturity has prevented any operations on the Mogul Block, which is carrying about half a crop. We have cleaned up all of the Parson Browns, Norris Earlies, 16 to 1, and other early varieties, and also find that practically all of the oranges qualify, and can be moved. Hutchinson and Crowell have instructions to push orange picking operations and keep the fruit going. Crowell states that with the exception of a little spraying the time of the force is taken up in picking up fruit. This expense is running about $50.00 a day, and exceeds the cost of picking. In the writer's opinion the dropping will be intensified with time, due to the injury to the bearing wood by Arsenical spray. By working in the grapefruit drops with the cannery stock we are able to make a little salvage to off-set the expense. We are writing Lee A. Strong today to see if there cannot be some modification of the clean-up regulations. The writer also made the acquaintance of Hoidale, who is the successor of Doctor O'Kane. He is younger, but appeared to be a very fair young chap. TANGERINES: The writer had Magnuson make a test, but the fruit failed to qualify. Magnuson will make two or more tests per week from now on, in the hope that some of the fruit will pass and permit a car to move prior to November 15. MARSH SEEDLESS GRAPEFRUIT: The writer also requested a test of this fruit, which did not pass. Chase, Joshua Coffin. 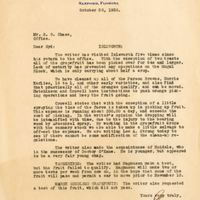 “Letter from Joshua Coffin Chase to Sydney Octavius Chase (October 30, 1930).” RICHES of Central Florida accessed April 24, 2019, https://richesmi.cah.ucf.edu/omeka/items/show/2743.